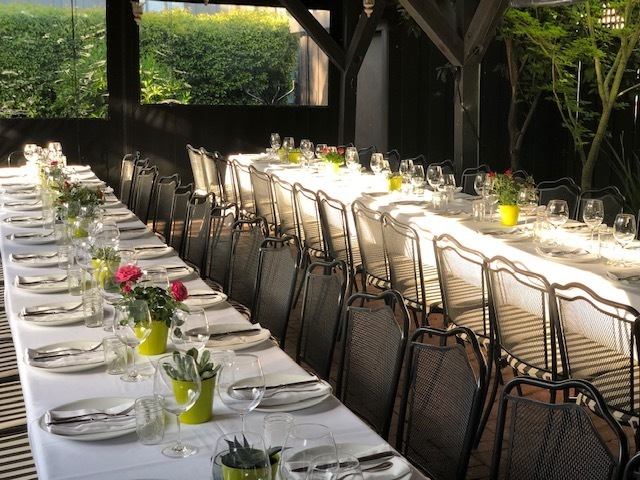 Evangeline, located within walking distance of all major hotels and resorts in Calistoga, is a perfect venue for your next private event. Whether you have an upcoming rehearsal dinner, wedding or even a corporate function, Evangeline has extensive experience in executing your special occasion with impeccable food, prompt and attentive service and world class beverages. Evangeline has a full bar and an extensive wine list featuring local and international offerings. Our cuisine has been Michelin Recommended since our opening in 2015 and has earned numerous awards and mentions in local and national publications. Our executive chef personally designs the menus for each individual event based on the clients' palates and desires. The jewel of Evangeline is our private, off the beaten path garden patio, which in the cold season becomes covered and heated. Our venue offers a great level of privacy for you and your groups during your event. We are ready to help you create a memorable event! Please fill out the following form to let us know more about your event. One of our event specialist will reach out to you to provide you more information. Thank you for considering Evangeline for your special event! Our Event Coordinator will get in touch with you shortly.